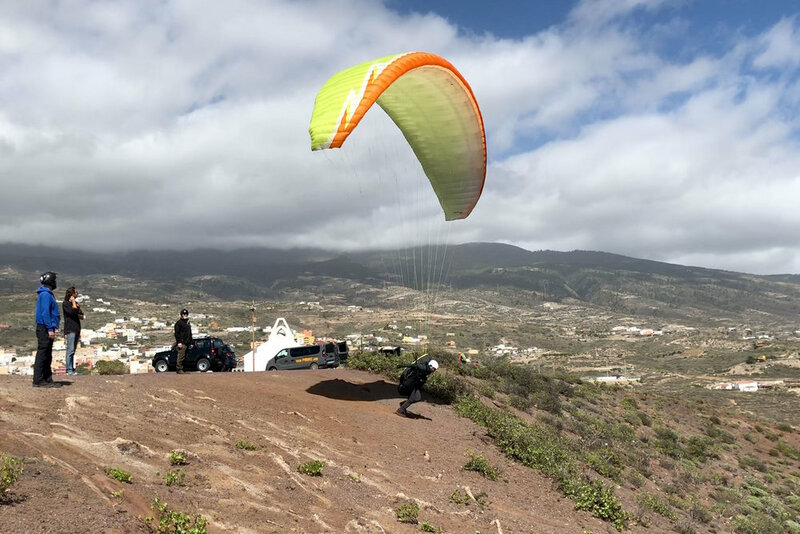 In March 2018, Paraglide New England escaped the dismal New England winter for an exploratory mission of Tenerife in the Canary Islands. Paul Somerset and myself were joined by fellow Vermonter and world traveler Eric Esser. The goal was to evaluate the potential for this location as a future PGNE tour destination with students. 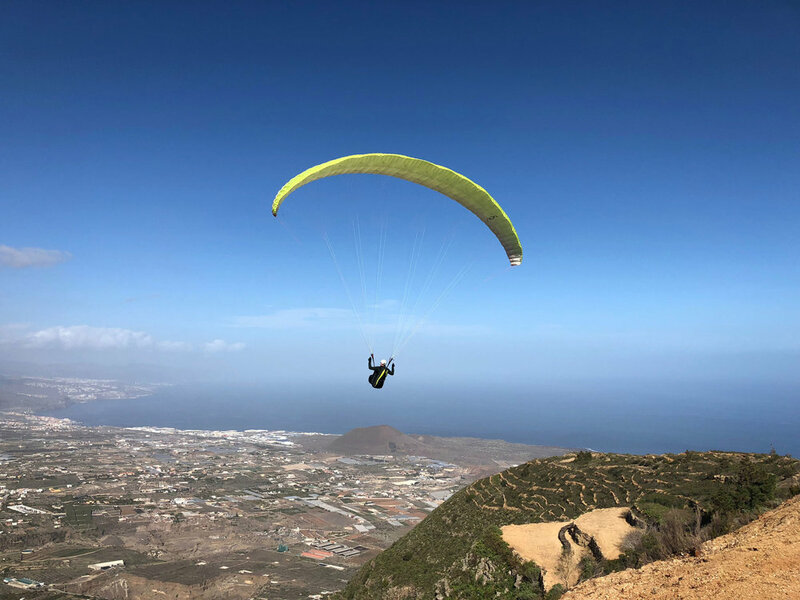 Initial research suggested Tenerife is a highly popular flying destination for Europeans boasting over 30 flying sites and consistent conditions all winter long. 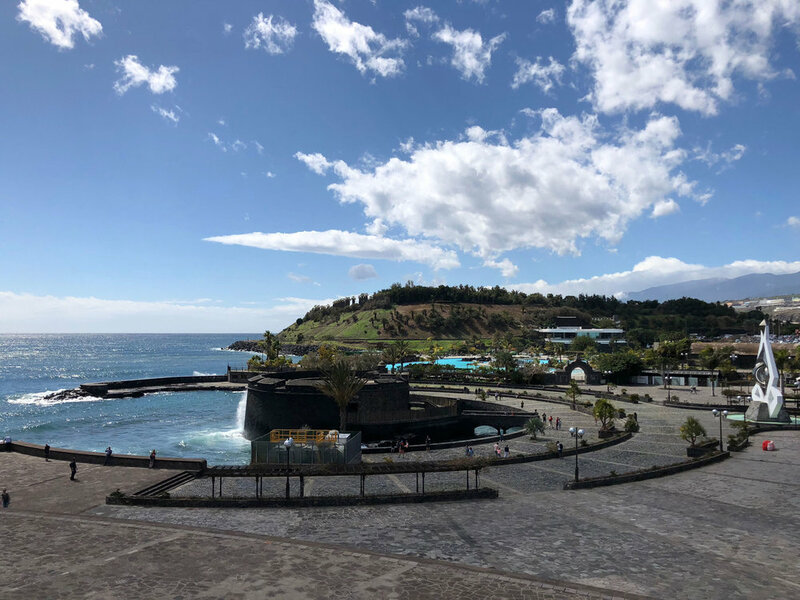 Tenerife appeared a strong contender for a mid-winter destination to rival many other popular winter locals, so we had to check it out for ourselves. 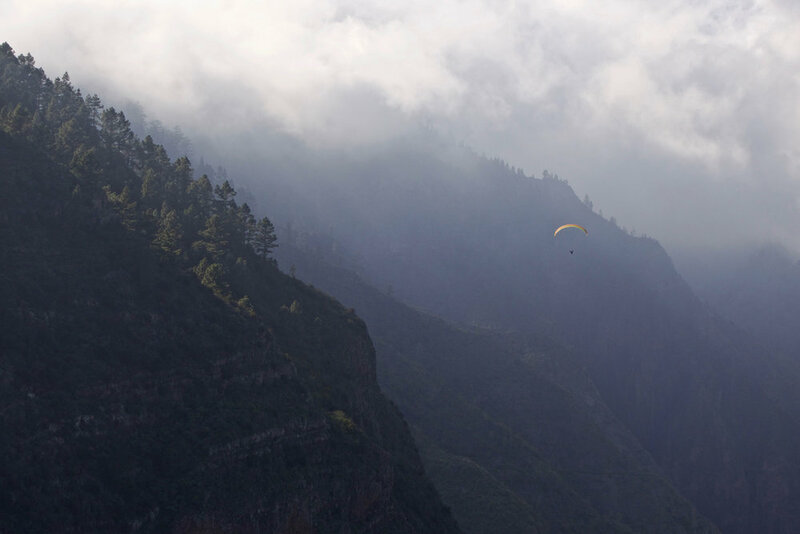 Getting to Tenerife was an easy, but long journey with airfare costing around $500. 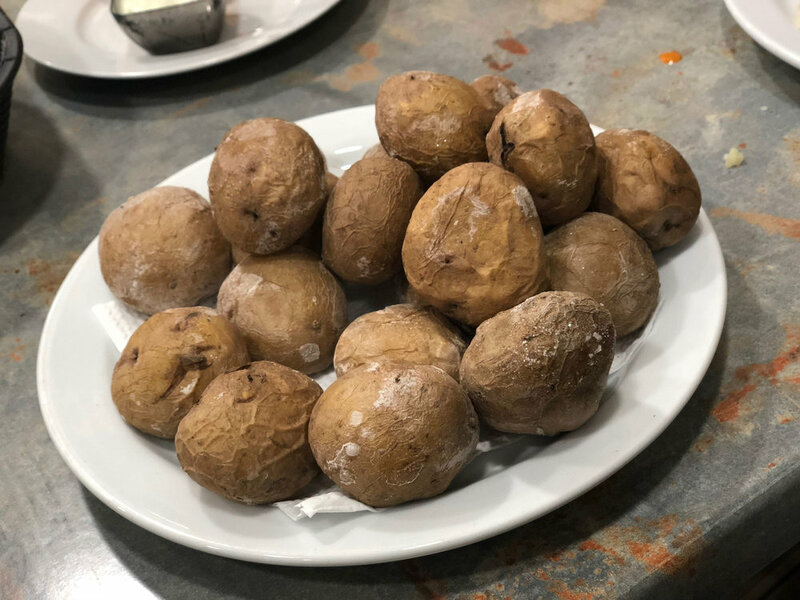 If you’re willing to pay extra, it’s possible to cut out a layover, but no matter how you slice it you must stop in mainland Europe before the final leg to Tenerife. As we approached, the island the spectacular 12,198’ snow-capped volcano of Mount Teide dominated the island. The next thing that grabbed our attention were all the palm trees bent over, as the island was being battered by gale-force westerly winds. Not what we expected! Remaining optimistic we ignored this and enjoyed our arrival in Adeje on the southwest of the island. Nestled against the lower flanks of Mt. 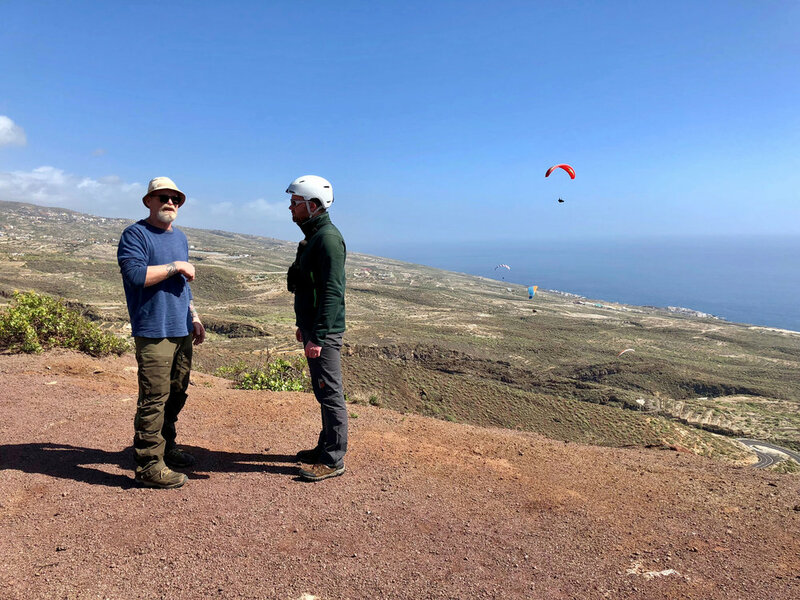 Teide, Adeje is a beautiful sleepy hub for paragliders that is a few miles inland from the more chaotic tourist haven of Playa de las Americas. Adeje has a distinctly European feel with narrow streets, sidewalk cafés and many fantastic restaurants. Except for the absurd wind, the whole vibe was very chill. 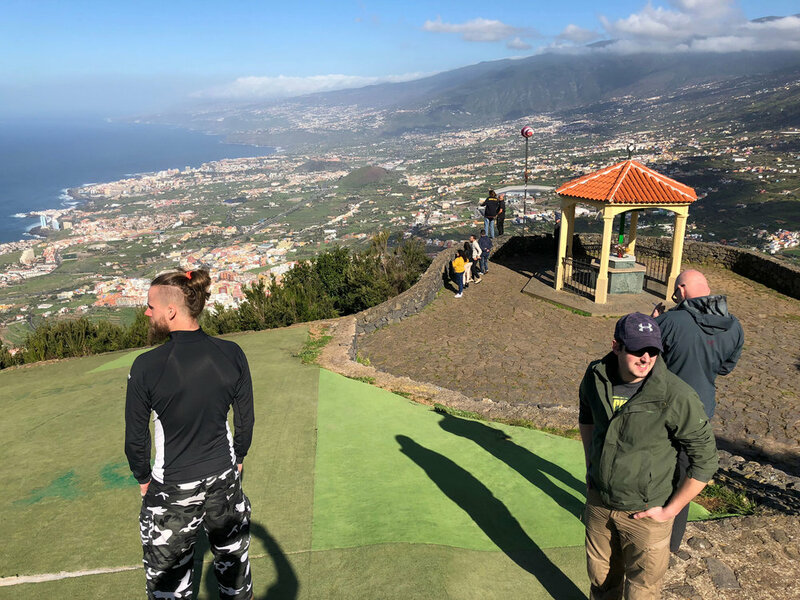 Though we weren’t traveling with kids, Tenerife is known as a family-friendly destination for anyone looking to balance a flying vacation with family. Immediately behind the village rises a stunning wall of rock with several launch sites including Ilfonche and Taucho. 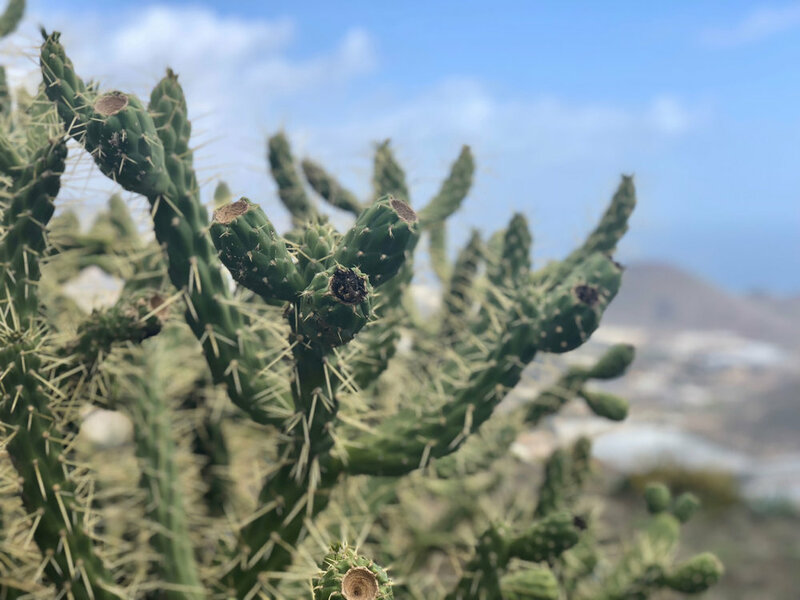 Generally, the west and southern parts of the island are arid, rocky and cactus strewn resembling New Mexico or Utah while the north and east are more lush and resemble Hawaii. We took the afternoon of the first day to relax and get organized. My weather app revealed an ominous forecast for the week ahead. We thought we had escaped the nor’easter storms of New England, but apparently they had followed us across the Atlantic. The storm tracks trended just north of the Canary Islands. This was unusual for that region as low pressure systems tend to move further north over Europe as the Canaries benefit from high pressure influence with prevailing winds from the north and east. We were seeing strong (40-50mph) winds from the west and southwest with no apparent end in sight! And so, the adventure began! Our first two days were a bust, but we had the opportunity to drive around the whole island (twice) and familiarize ourselves with various flying locations and explore other towns. Another benefit to the down time was to witness the dramatic weather and scenery changes from one end of the island to another. The island is roughly 50 miles long by 30 miles wide at its extremes and possible to circumnavigate in about 3-4 hours. In such a small area, I found it remarkable to go from completely socked in with clouds on one side to beautiful sunny clear conditions on the other. If only the wind would calm down! Village of Taganana on the northeast point of Tenerife. The (advanced) launch of Taganana is located behind the further of the two ridges with buildings on the side. On our third day, the wind eased slightly, and local intel suggested that lee-side flying was possible on the southeast at the launches of Fasnia and Güímar. Off we went in search of a pocket of friendly air. Mind you, we were still seeing clouds ripping past Mt. Teide and white caps on the ocean around Adeje. We first explored Fasnia launch. A mile or so upslope from shore with only about 400’ of relief, its low profile and position in the lee of Mt. Teide, offered perfect lee-side flying. The eastern aspect of launch treated us to early thermal development and the profile of Mt. Teide and it’s mid-elevation topography kept the high winds and rotor effects at bay well above us. 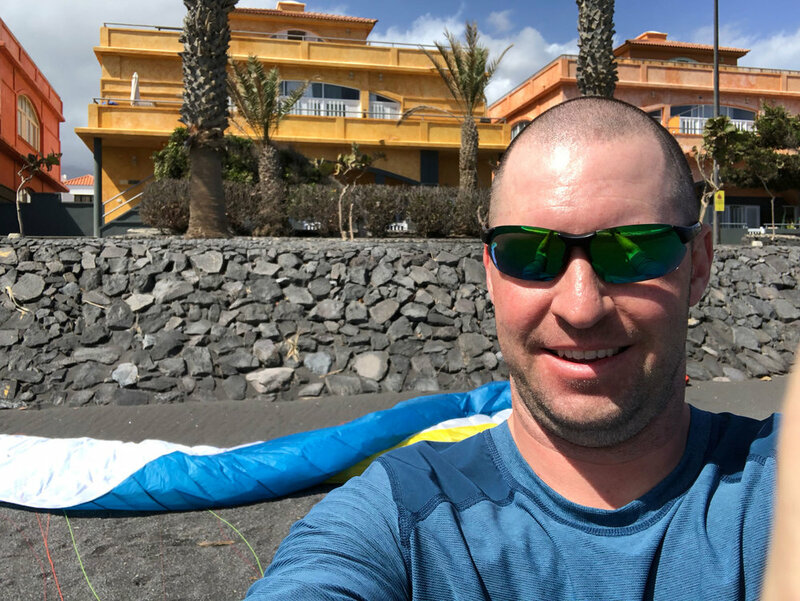 Itching to go, we were informed that a local XC task was to make a relatively short 10k crosswind hop to the town of Puertito de Güímar, land at the beach and enjoy lunch at one of the various sea-side cafés. If that doesn’t sound like the definition of inviting, I don’t know what does! Eric was first to launch with Paul close behind. I brought up the rear after snapping photos. There was a variety of European pilots in attendance, but most settled for sticking close to launch. Paul was first to break toward goal and well on his way when I launched. It was an interesting scenario to say the least. The thermals were good but short lived. Base was only at around 3000’ and we launched at about 1300’. We did not have a lot of altitude to work with, which made this a technically challenging, fun little XC. The terrain below was mostly a slope of undulating ridges and deep gullies covered by lava rock strewn with cactus and only occasional small agricultural terraces around sparse settlements… not exactly inviting landing options. What initially seemed like an easy task, was now understood to be quite a bit more challenging. After topping out the first thermal, I ventured away from launch chasing after Eric. Then I saw Paul, who at last glance appeared well on his way to goal, heading back toward me! Perplexed, I watched him pass by me and top-land back at launch. I hadn’t heard a peep from him over radio so assumed he was having radio issues. Later he admitted as much and with a wry smile noted his preference for “out-n-backs” and top-landing. Indeed, his flight covered more distance than had he simply gone to goal. I turned my attention to the task at hand and worked to catch up to Eric who was quickly putting distance on me. Halfway down course, a layer of clouds began encroaching from the west, reducing thermal energy. Feeling the pressure to stay high I used every trick I could think of. For half my flight, I bopped along between 300-1000’ AGL. Over the radio Eric reported that he had made the move toward the coast, but had bombed out just shy of goal. Now on my own, I approached the final landmark en route to goal, a long ridgeline descending from Mt. Teide to the eastern coast line. From that ridge it was an easy glide to goal, but I still had to make it there. Still about a mile shy, I was scratching terraces and rooftops of a small village when, for a poignant moment, I was struck by a barrage of barks and yelps of dogs who must have eyed me with interest as I drifted overhead. Much to my relief, I got one last boost from a thermal and was on my way. I cleared the ridge at about 400’ AGL. I was relieved and shocked as the ground suddenly dropped away precipitously beneath me. My ground clearance doubled as I flew over an immense cliff face. Later we learned this same ridge offers the Güimar launch, which would become our regular haunt. With a reassuring band of lift pushing up the cliff face, I surfed this rising air all the way to the beach. Touching down amongst tourists and sunbathers on the black sand was a moment to savor; that was a heck of a first flight in Tenerife! Profile of the author's first flight. The paraglider icon marks the low save above the dogs. Click image for interactive flight log. For most of our trip we routinely flew the site of Güimar. 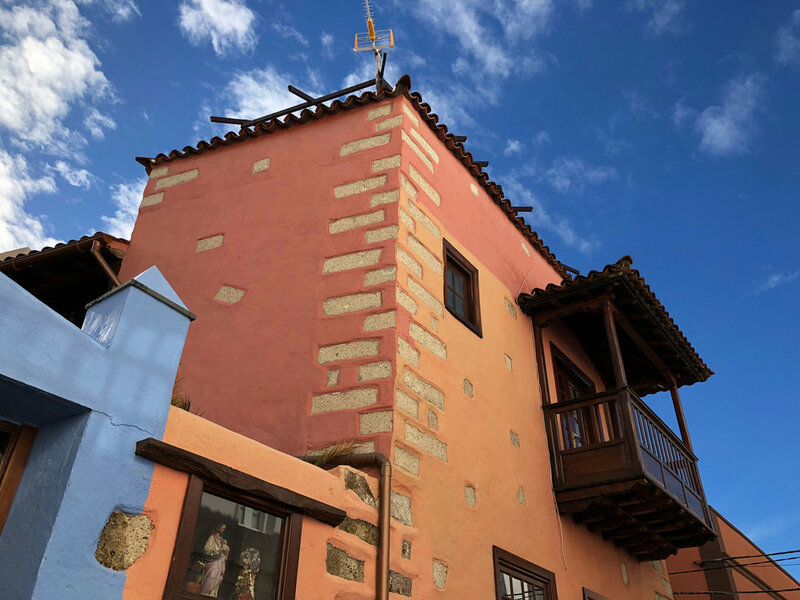 This Location enjoys a natural horseshoe-like profile of the mountains around the towns of Güimar and Arafo with ridge-lines along the south, west and north and an expansive valley open to the ocean sea breeze from the east. with the prevailing westerly and southwesterly winds, this site proved a paragon of lee-side magic and unlike anything I had ever experienced. Not only was it protected from westerly winds aloft, but it benefited from early thermal development and anabatic uplift while the westerly winds, wrapping around the southern part of the island, circled back from the east at Puertito de Güímar, ultimately reversing direction toward the south ridge in the lee-side wind shadow at launch. One of the better launches around Tenerife, Güimar was fabulously constructed. 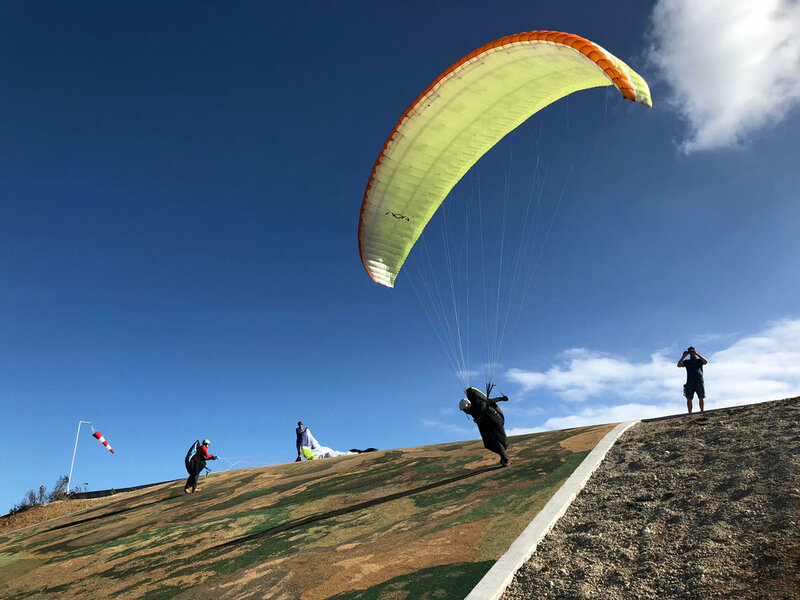 A wide rock buttress backstopped a gently rolling ramp covered in a rubber padded surface with room for two gliders side-by-side. It was cush! A clear diagram of the site introduced visitors to the launch and LZ options and a harness simulator was on site. The only detractor from an otherwise ideal launch, was the precipitous cliff at the end. Minor detail. Other than that it was beautiful! The daily routine at Güímar was beautiful! Typical flights delivered a mixture of ridge soaring and thermalling along the spectacular cliffs of the southern rim of the horseshoe valley. XC potential is there for the adventurous in the form of a 15 mile round trip contouring the valley in an arc; first west, then north and finally, east toward the beach. Or you can opt for a chill flight with local soaring and then head straight out to the beach. Either way, you’ve got yourself an incredible soaring experience in island paradise! 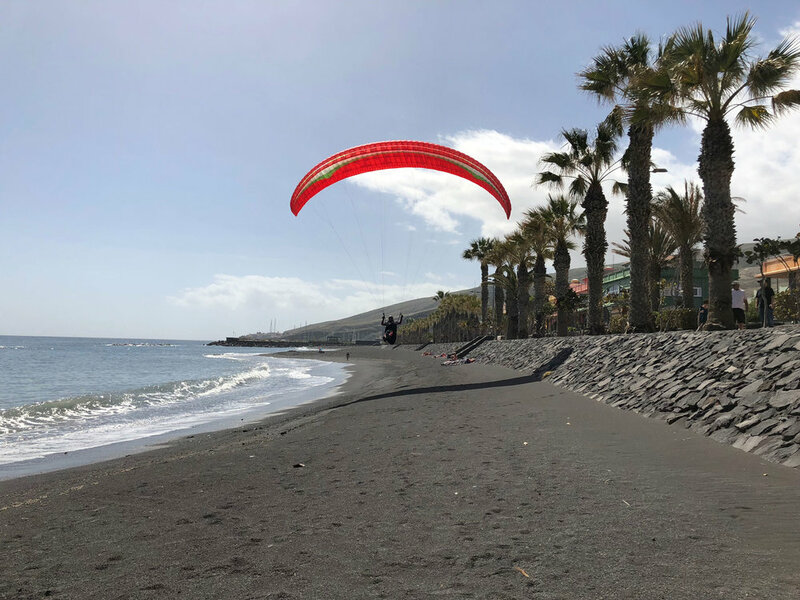 The flight ends with ether an LZ right below launch or if you opt for a short XC to the black sand beach you will be rewarded with nice laminar air and cheers of admiration from beach goers. With the ability to do many flights in a day and enjoy a lovely evening glass-off, it’s a fine flying site to be sure…. but after nearly a week of hiding in the lee at Güimar, we itched for new sites. On our last day we were finally greeted to a welcome change in the weather pattern. Winds shifted to the north and opened up a whole new aspect of the island for us to explore. 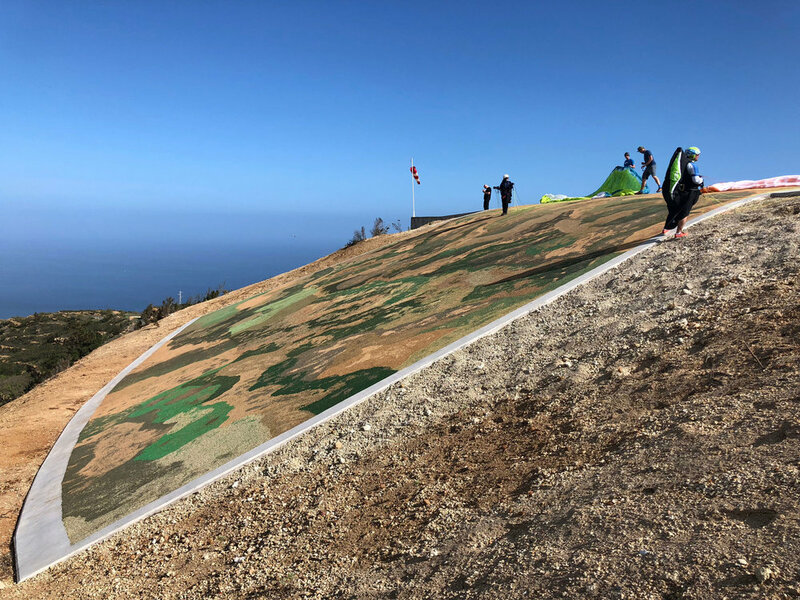 We decided to check out the launch of Tierra del Trigo near El Tanque on the northwest of the island. We arrived at launch after winding our way up incredibly exposed, narrow mountain roads that had me checking for my reserve handle while driving. The shift of location introduced a dramatically new landscape. The arid desert conditions had given way to lush, semi-tropical vegetation. The landscape was marked by incredibly steep ridges, cliffs, and canyons careening toward the vivid blue ocean. It resembled Hawaii. Winds were fairly light but thermals were developing and cumies were forming as the sea breeze converged on the higher terrain. Launch was a little tricky, with thorny bushes at the end just before rolling over into a 2000’ cliff. Several pilots not in our group were already on launch and appeared challenged by the arrangement. Unfazed by all of this, Paul was first of our crew to launch. Eric launched shortly thereafter, and I brought up the rear to join the crew in the house thermal. Then we began exploring the ridges and cliffs in front of launch with a brief inspection by a "local" as we did. From our new vantage point, we fully realized the stunning beauty of this side of the island. High above us the snow capped peak of Mt. Teide poked out of a developing cloud layer. Here the island had two distinct personalities: Above; a cold, windswept alpine landscape and below; a lush mountainous scene right out of Jurassic Park. Cloudbase was only at about 4,000’ and we flirted with it as we explored westward, traversing the rugged canyons and ridgelines that lead inland. 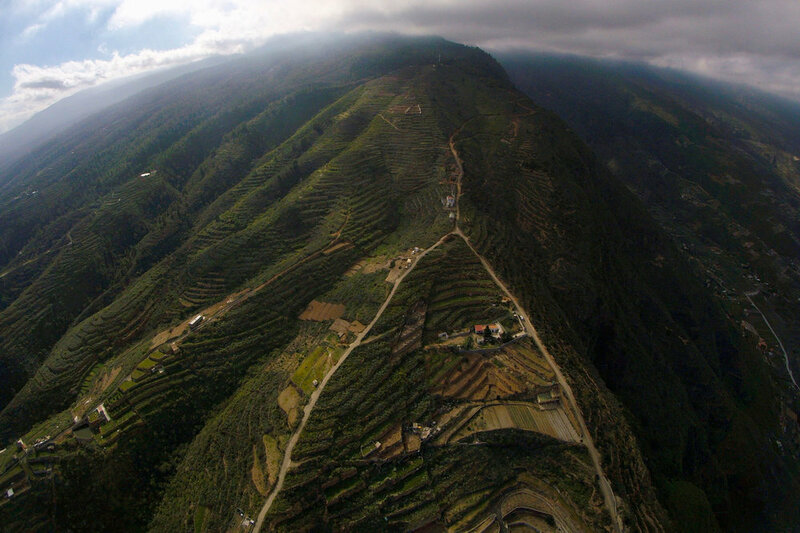 Agricultural terraces stepped down the lower flanks of the cliffs to a flat expanse of banana plantations and fields that fanned out to the jagged coastline below. I was chasing Paul as clouds began shading us out in the vicinity of launch. Sinking fast we pushed northwest seeking sunshine close to the LZ near the coastal town of Puertito de los Silos about two miles away. Eric squeezed out a bit more lift near launch before giving chase. We were each separated by a quarter mile or so as we descended toward the sunshine that bathed the flatlands ahead. I watched Paul ahead of me search for lift to no avail, before he landed. I was preparing to do the same when suddenly, with less than 400’ to spare, I felt a reassuring bump. My vario confirmed the find. I hooked into the thermal and began circling. “Game on!” I hooted as Eric made a b-line for my thermal. Fifteen minutes later, we were back at launch height, working the lift along the ridges. We flew west, passing over one ridge after the next. It became an effortless task to stay aloft. 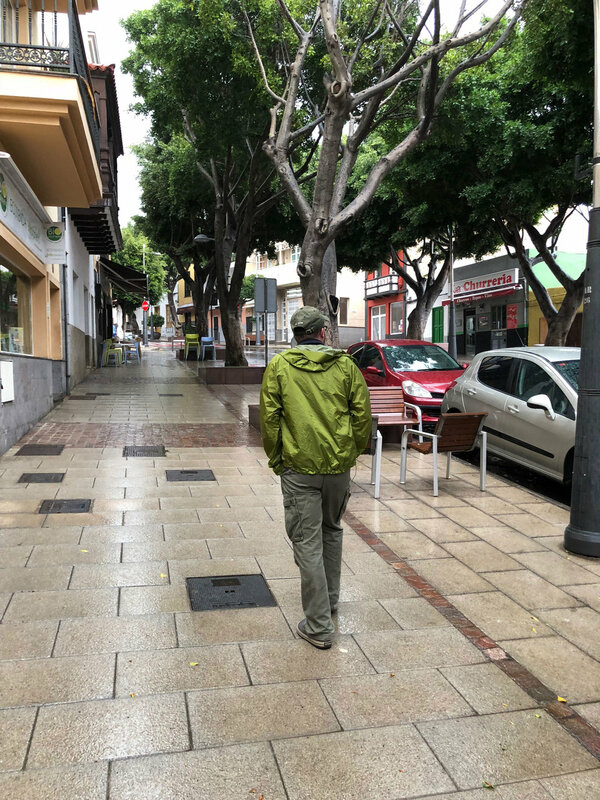 Eric and I swapped turns taking lead as we cruised over the colorful landscape and villages below… Los Silos, San Bernardo, Las Canteras and Buenavista. My only distraction was snapping photos. 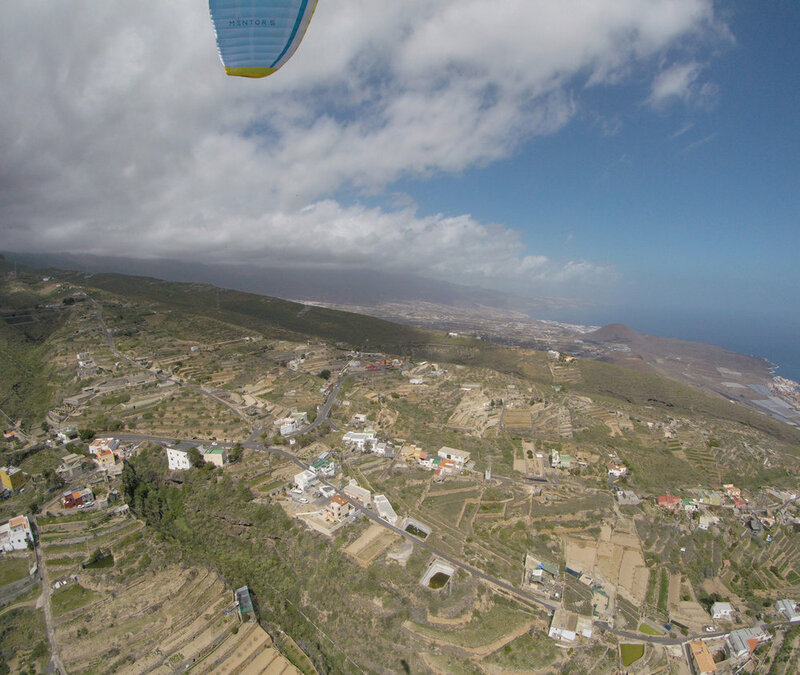 Onward we flew until nearly reaching Punta del Fraile. At this logical turn point we reversed course. Ultimately, Eric and I retraced our path nearly back to launch before we chose to land. 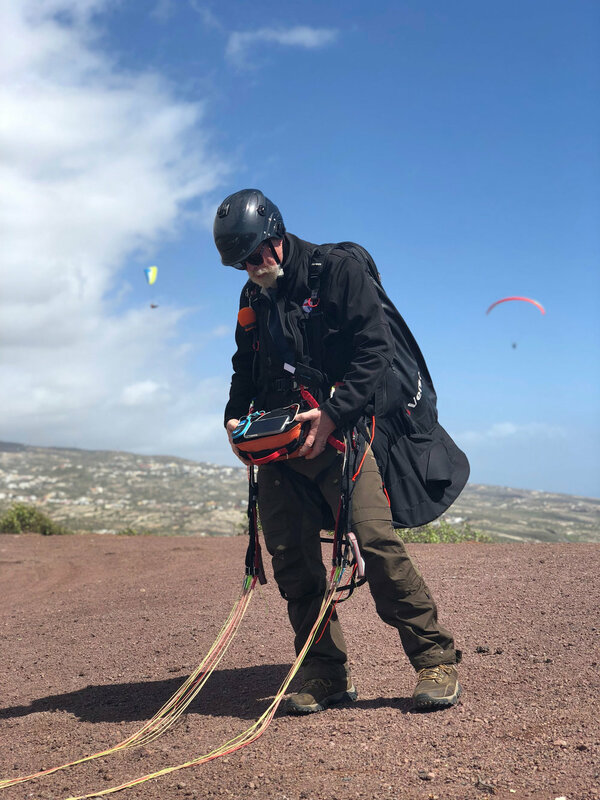 Tiere del Trigo flight log with paraglider icon marking point of low save shortly after launch. 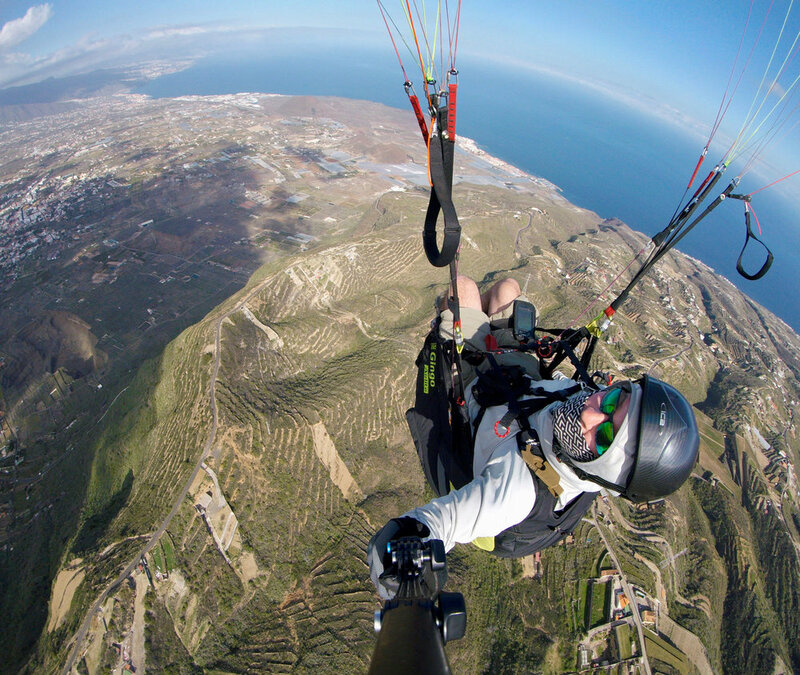 We went back up for another launch from Tierra del Trigo and enjoyed a lovely 45 minute flight. Then later in the evening went to the Taucho launch located on the the cliffs directly above our hotel in Adeje. Soaking up the sunset on that last flight, it was clear that we had ended on a high note. 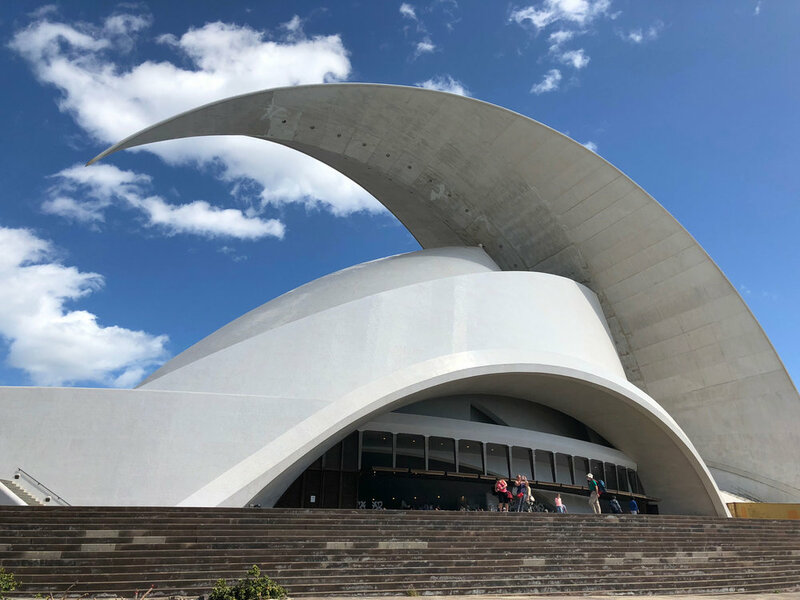 A question remained: Did Tenerife meet expectations? Without a doubt we enjoyed some very good flying. We did great despite atypical weather conditions that made flying more challenging than expected. Will we go back? Hard to say. 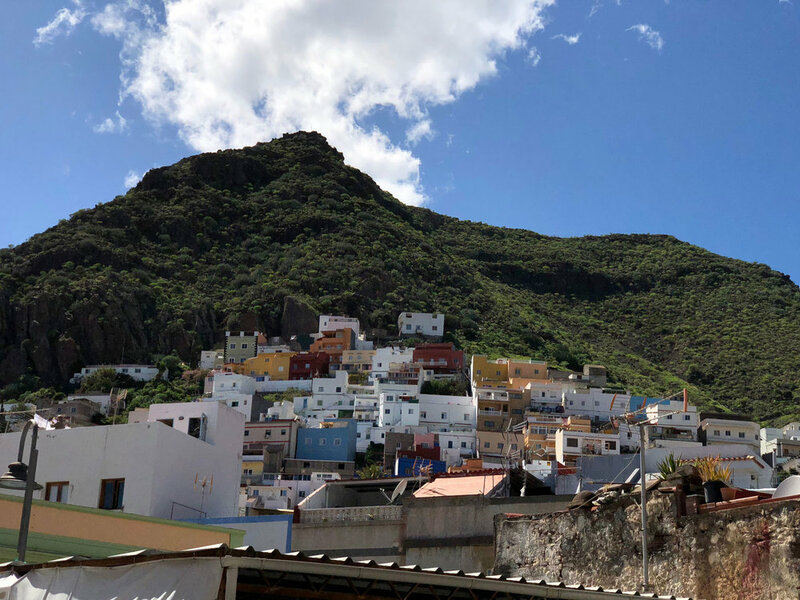 With many sites left to explore, there’s certainly more to see in the Canary Islands. But our regular flying trip to Valle de Bravo, Mexico is a very tough benchmark to beat and we are excited to continue exploring other destinations. Plus Tenerife is not the easiest place for new pilots to fly. So at the moment we don’t know if we will return or not. One thing is for sure: We sure enjoyed the adventure!